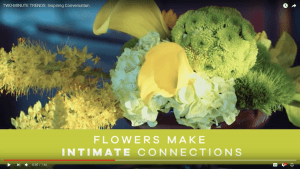 The “Two-Minute Trends: Inspiring Conversation” video touts the Rutgers University research that proves the presence of flowers leads to increased contact with family and friends. Looking to elevate your promotional efforts with new professional floral photography and videos? Check out “Two-Minute Trends,” available from the Society of American Florists’ consumer website at aboutflowers.com/twominutetrends. SAF, in partnership with Asocolflores, produced the “Two-Minute Trends” seven-part video series and accompanying floral photography as part of The Architectural Design of Flowers program to educate the media, interior design community, consumers, and the floral industry about the scientific benefits of living and working among flowers, as well as color trend news for residential and commercial spaces. The videos combine the advice of interior designer Kelli Ellis – of HGTV, Modernism Week, Maison et Objet – with the expertise of color trend expert Mark Woodman. Together, they demonstrate the art and science of flowers as a design tool to inspire emotions and actions within public and private living spaces, as well as work environments. SAF member Tim Farrell, AAF, AIFD, PFCI, of Farrell’s Florist in Drexel Hill, Pennsylvania, arranged the floral designs shown in the videos and photography.